Walkin’ In the Sunshine is a bouncy, fun track that immediately showcases the talent and pleasant attitude of In-A-Chord. A strong production allows the act to come forth and shine effortlessly. The retro is made new with this act, as there are hints of Carole King and The Carpenters here in the male/female dichotomy here. With nods to both classic Christian music as well as the easy-listening rock of the 1970s, there’s no denying the band. 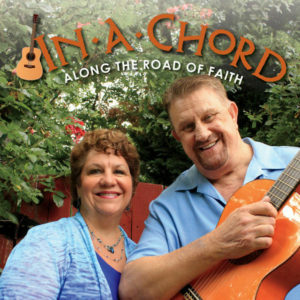 On The Path of Glory, In-A-Chord is able to add a bit of country and western and bluegrass together. The narrative quality of the act is fantastic here, as listeners will be kept on the edges of their seat through the entirety of the track. During the titular track on Along The Road of Faith, a slower sound dominates. It is the tremendous amount of care that the duo takes in crafting this track that will endear them to anyone that is listening in. Vocal and instrumental sides are built up equally, so that each note, each lyric, and each voice is given an equal share of the track’s success. The chorus of Along The Road of Faith is beautiful, providing fans with an uplifting sound that is tremendously complex as the act moves into the post-1:35 mark. All it Takes is Love is another high-water mark for In-A-Chord during Along The Road of Faith. It is this track that showcases Cindy’s vocals clearest. This riveting song rises and falls in a fashion that is wholly different from the rest of the tracks on the album, while maintaining the same cohesive sound that is imprinted upon all of In-A-Chord’s tracks on the album.